See Outputting text to the console in the documentation of console for details. Chrome Full support Yes Edge Full support 12 Firefox Full support 4 IE Full support 8 Opera Full support Yes Safari Full support Yes WebView Android ? Chrome Android ? Edge Mobile Full support Yes Firefox Android Full support 4 Opera Android ? Safari iOS ? Samsung Internet Android ? Notes In version 28, if a negative value is passed to %d, it will be rounded down to the closest negative integer, so -0.1 becomes -1. Opera ? Safari ? WebView Android ? Chrome Android ? Edge Mobile Full support Yes Firefox Android Full support 9 Opera Android ? Safari iOS ? Samsung Internet Android ? 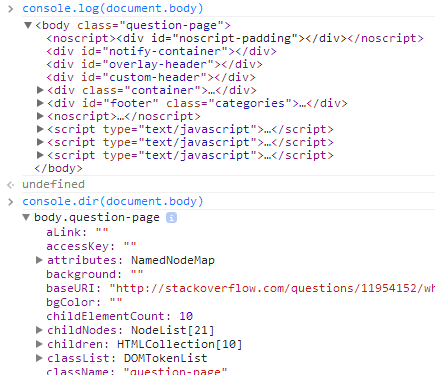 You might ask yourself what's the difference between console.dir() and console.log(). Another useful difference in Chrome exists when sending DOM elements to the console. Specifically, console.log gives special treatment to DOM elements, whereas console.dir does not. This is often useful when trying to see the full representation of the DOM JS object. There's more information in the Chrome Console API reference about this and other functions. This way you are sure you are seeing the value of obj at the moment you log it. Otherwise, many browsers provide a live view that constantly updates as values change. This may not be what you want.